Hello! Hope your week is going great! 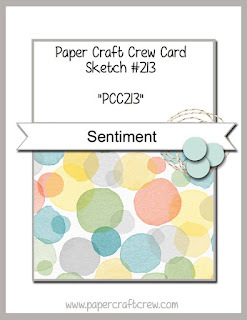 I'm pretty excited about this week's sketch over at Paper Craft Crew. This one was a lot of fun! I started off with an 11" x 4 1/4" sheet of Real Red Cardstock that was scored at 5 1/2". I added a 3 1/4" x 4 1/2" piece of Early Espresso cardstock that has been embossed with a woodgrain embossing folder. I adhered that to my card base with Fast Fuse. I added a small piece of 3-1/4" x 2- 3/4" of the Candy Cane Lane DSP onto the lower portion of the rectangle. Using Santa's Sleigh framelits, I cut out the sleigh in Crumb Cake and then more detailed version of the upper part of the sleigh in Real Red. 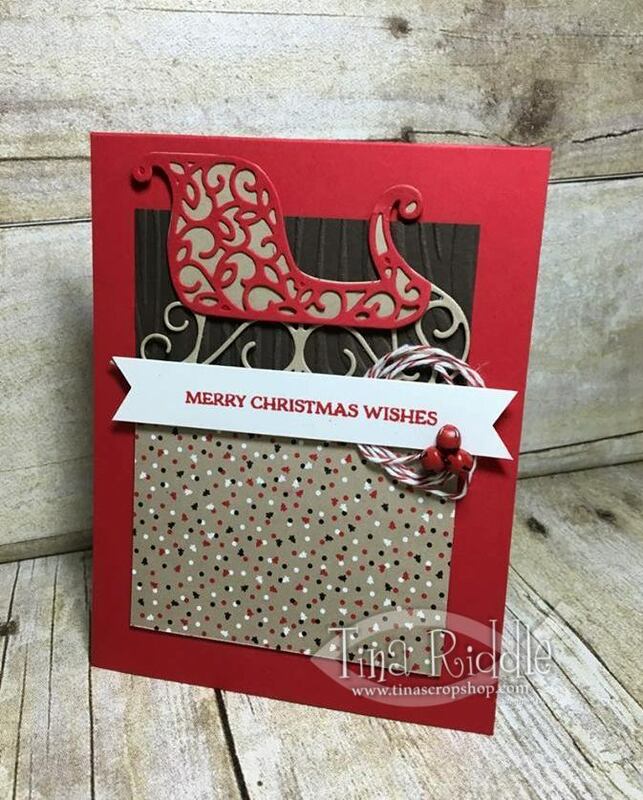 I attached the Real Red detailed sleigh die cut over the Crumb Cake die cut with my Fine Tip Glue Pen. Next I stamped my sentiment in Real Red onto a strip of Thick Whisper White cardstock. I used my Banner Triple Punch to punch the banner ends on it. Using two fingers, I wrapped some Cherry Cobbler bakers twine around my fingers three times and then laid it where I wanted it on my card. I then added Dimensionals to the back of my sentiment banner and placed it over my card and the circles of twine so that it would hold the twine in place. I then added some fast fuse to the back of my sleigh and then tucked it just under the banner and held it down to adhere it. I decided to add two glue dots onto the top corners to make sure it stayed in place. Then came the super fun part.. I decided to use the fabulous mini jingle bells for the little circles in the sketch. To attach the mini jingle bells I ran some Red Metalic thread through the top of the bells and knotted it once it was run through all 3 of them. I cut off the stray ends and attached the three jingle bell strand with my Fine Tip Glue pen. It took just a few minutes for the bells to set.. how stinkin' cute are those little bells??? I LOVE them! 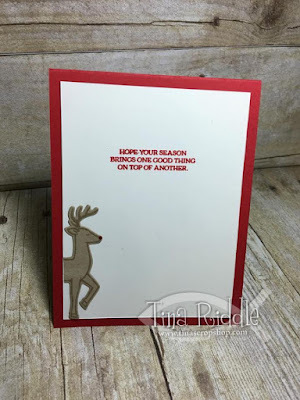 For this one I stamped another sentiment from the same awesome Santa's Sleigh stamp set in Real Red onto Whisper White cardstock. I stamped the reindeer tone-on-tone on Crumb Cake and then cut it out with the coordinating framelits. I decided to just use the front of the Reindeer so I cut it in the middle and attached to the inside of my card with Fast Fuse. I used a Real Red Marker to make his nose red.. I mean it is Rudolph of course! Stampin' Up! World Card Making Day Blog Hop! SIP Challenge #67 - Sketch Challenge! SIP Challenge #66 - Anything But a Card! SIP Challenge #65 - Monochromatic!! OSAT Blog Hop - Birthdays Bash! ICS Blog Hop - Technique Time! SIP Challenge #64 Clean & Simple - Less is More!